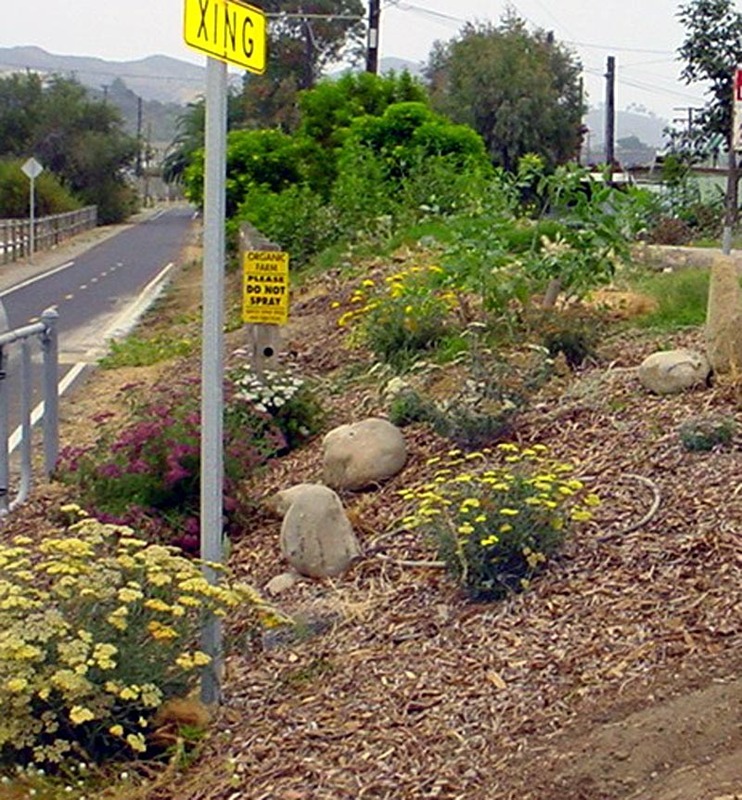 The B3 Garden (B3 for Beneficials, Butterflies and Bees) on the boundary between the Bugfarm and the Ventura River Trail started with a demonstration of refuge for natural enemies of whitefly. Mixed insect habitat hedge to attract whitefly parasites: Yellow Bells, California Buckwheat, Lavatera and Rue with Bishop's Weed, Allysum Barley Grass, and California Poppy..
Last winter  we installed a new section with insect attracting plants. We were motivated by having won a tray of 20 plants for a butterfly garden at the annual holiday scholarship fundraiser dinner auction put on by our energetic local Ventura County chapter of the California Association of Nurseries and Garden Centers. Yellow Bells below established with almost no watering into an attractive small tree. Before we planted, we put down cardboard mulch for weed prevention. You have to use at least 2 layers with at least 6 inches of overlap and plenty of overlap on the edges. Wet down the cardboard so they conform to each other when you pile mulch on top of it. We used 6 inches of what we call “media mulch”, a by-product of our fly production (see signage text below). Several inches of sawdust from the local lumberyard made a nice path. We made wire baskets to protect each plant from gophers, putting the baskets in holes in the cardboard. Duke laying out hose on top of the cardboard sheet mulch to plan out a path in the garden installation. Daniel working on layout while Duke spreads the sawdust for the path. Bryce ready to help Jan and Daniel clean up the garden. What a joy to plant a Butterfly Weed and just like clockwork spot the color–coordinated Monarch butterflies feeding and laying eggs and then encounter the bush covered with big striped caterpillars munching away. Monarch caterpillars can only survive on this plant. We really feel like nature's helpers when we provide essential food for such beautiful creatures. The two hardest weeds to prevent and get rid of around this place are kikuyugrass and a new invasive feathertop or fountain grass. Kikuyugrass took hold in the planting hole with the Asclepias and along the edge of the garden. It took off––you can see a deep patch of it behind the Asclepias. If we had known what we know now about it, we would have been more vigilant when we first saw it! “There are few options for the control of kikuyugrass in ornamental plantings. Prevention is very important, as is hand–removal or spot–spraying of solitary plants. Since we don’t like Roundup, we would use a strong detergent (1 cup/gallon) solution as a contact herbicide. Hand weeding is the primary method of control in the home garden. Cultivation or hand hoeing, although possible under some circumstances, is generally detrimental because it breaks rhizomes and transplants them to new areas. This is particularly true if irrigation follows hoeing. Used cardboard was placed two layers thick on the soil and 6 inches of mulch was placed over it. The plants were planted in holes through the cardboard. The cardboard keeps weeds from growing for several years, giving plants a chance to grow without competition. Worms find habitat in the cardboard layers. Plants were selected for hosting the silver leaf whitefly and its parasites. California Dept of Food and Ag and the Dietrick Institute planted these hedgerows to help control whitefly in crop fields. Photos are at the top of the page. Rue or Desert Ruellia (Ruellia peninsularis). Native willow attracts beneficial lady beetles, wasps and hoverflies. Branches can be pollarded to produce a lot of small branches. These branches can be used for plant stakes, weaving trellises and other garden structures. Each winter the branches are cut back to the trunk and the tree grows a new crop of branches in the summer. Don’t pull all the malva! A weed that hosts the caterpillar of a native butterfly, West Coast Lady or Malva Butterfly, Vanessa carye Hon. It attracts aphids and their good parasitic wasps and predatory ladybugs. Its deep tap roots condition and aerate the soil. Malva has culinary and medicinal uses based on the mucilage it contains. A relative of hollyhock its flowers are not dramatic, but its green seed pods are edible. We get our mulch as a by-product of beneficial insect production by Rincon–Vitova Insectaries. The company grows millions of flies daily in summer and then rear a tiny parasitic wasp on the fly pupae for sale to horse and livestock facilities. We use the “media mulch” waste product in our gardens and make it available to local gardeners. Yarrow does well with little water; spreads out by runners and so can hold a bank. It provides pollen and nectar to a wide range of beneficial insects, hoverflies, wasps and lady beetles. Yarrows come in many colors, forms and sizes. The B3 Garden on Memorial Day 2008. Entrance to Bugfarm adorned with yarrow. Daniel and Kyra reading new educational signage (purple Bee's Bliss in background, volunteer yellow evening primrose, and pink yarrow). Beautiful Salvia Bee's Bliss bringing in bees and parasitic flies. Duchess guarding the B3 Garden against 3 year old girls on tricycles on the bike trail.